Renowned dissident intellectual Noam Chomsky says anti-democratic neoliberal economic policies fuel the rise of neo-fascism and threaten the EU. 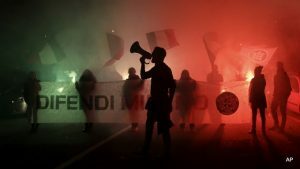 CasaPound right-wing demonstrators outside the former Montello barracks, where migrants are being transferred by Milan’s prefecture, in Milan, Italy, Monday, Oct. 31, 2016. Chomsky went on to point out that these policies are leading to the dramatic rise of Europe’s far right. “The French election that’s coming up there are basically two candidates one of them ultra-right, the other far-right, both of them to the right of the U.S. political system. It’s a pretty dramatic fact. In Austria the candidate of the Freedom Party, which has neo-Nazi routes, may win the presidential election,” Chomsky said. Chomsky’s comments are echoed in a new study by major European foundation Bertelsmann Stiftung which, after a massive survey of European public opinion, found that extreme-right populist parties – such as the National Front in France, and Germany’s anti-immigrant Alternative for Germany party – are benefitting from the “recruitment of worried citizens,” who have been made vulnerable by the neoliberal demand for domestic austerity policies. The report found that fears about neoliberal globalization correspond to educational and income levels. “The lower the educational level, the lower the income, and the older the people are, the more likely they are to perceive globalization as a threat,” the report said.